Earlier this month, Dr. Scott Gottlieb, the popular FDA Commissioner, announced he is resigning. Gottlieb was appreciated by stakeholders on both sides of the fence due to his innovative thinking and desire to rethink traditional clinical trial processes in favor of more streamlined approvals and reviews. During his short tenure as commissioner, the FDA approved a record number of treatments and drugs while advancing policies that confront public health issues including the opioid crisis and e-cigarette use. Gottlieb was also passionate about restructuring the clinical trial process, specifically how real-world data (RWD) and real-world evidence (RWE) can enhance understanding of how therapies work and accelerate the drug approval process. 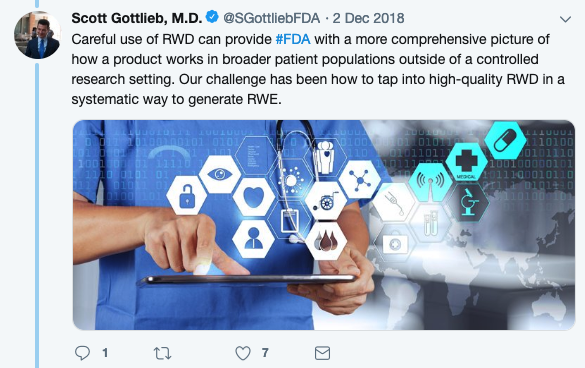 While traditionally RWE has been used to answer post-market safety questions, Gottlieb urged for the inclusion of this information to help make premarket decisions on medical devices. He emphasized the importance of not only determining if a product is safe for its intended use, but moving beyond that to understand long-term outcomes in patient groups as they leave the clinical trial setting – where the majority of patients are treated. In a decision consistent with his passion for RWE, Gottlieb named Dr. Amy Abernethy to one of the FDA’s highest positions, Principal Deputy Commissioner for Food and Drugs. Abernathy, an oncologist and former CMO of Flatiron Health, has been on the front lines of cancer innovation for years, dedicated to making the best use of RWE to impact overall patient care. The FDA has also developed a strategic framework to support the use of RWE in the development of drugs and biologics. In addition to his many initiatives, Gottlieb was known for his open approach to communications – issuing several hundred statements through official FDA channels and maintaining an active Twitter presence during his tenure. This approach helped forge a true partnership between the industry and the public as Gottlieb took a patient-centered approach to his work. Shortly after the news of Gottlieb’s departure, the FDA announced that Dr. Norman (Ned) Sharpless will lead the organization temporarily until a more permanent replacement is found. As the current leader of the National Cancer Institute, many expect Sharpless to replace Gottlieb on a permanent basis – but it remains unclear how much of Gottlieb’s approach to innovation will remain. Following the FDA’s transparency over the last two years, both the industry and public will look to Sharpless to stay informed on the organization’s initiatives with the same level of open communication we have grown to expect. Having a broader picture of how therapeutics perform in the real-world is in the best interest of patients – especially because clinical trials reach only a small percentage of cancer patients. As Dr. Sharpless has deep experience in cancer research, clinical trials, and healthcare innovation, we can expect RWE to be a major focus during his time at the FDA. We recognize the potential for bias in the application of RWE to important research questions; however, to account for this, the industry must work together – including pharma companies, providers, academic medical centers, government agencies like FDA, and data and analytics companies, including leading RWD companies like COTA. We believe the future of clinical cancer research is evolving and hope the efforts and groundwork laid by Gottlieb to incorporate RWE into not just post-market analysis but also pre-market development and clinical trials will continue under new leadership.